CLUTCH have announced a run of headline "Psychic Warfare Tour" dates for this May. 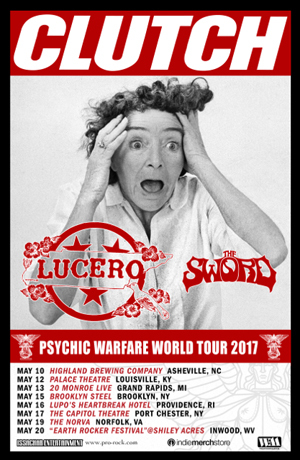 Support on the jaunt will come from LUCERO and THE SWORD. The band also announced their first annual Earth Rocker Festival at Shiley Acres in Inwood, WV on May 20th. Full line-up to be announced soon. Pre-sale tickets available now, public stale starts 10 AM, ET on Friday. Ticket info is available at THIS LOCATION. “We did a whole bunch of touring in 2016,” states the band’s front man Neil Fallon. “Right now, we’re cooling our heels and starting to kick around some riffs for the next record. We hope to be recording the LP come the end of the year. Where and with whom is yet TBD. At the moment though, we’re really just at the beginning phase of writing and we already have a surplus of ideas.